Malta is an absolutely incredible place to live. Set in the middle of the Mediterranean Sea, the Maltese Islands are filled with natural beauty. Stunning beaches, such as Mellieha Bay, Golden Bay, Ghajn Tuffieha and Paradise Bay, line the north half of the island. Dingli Cliffs are also impressive, and so is the view! Turquoise waters can be spotted almost everywhere off the coast, the most iconic of which can be found at the Blue Lagoon in Comino. Over in Gozo, you can find some idyllic red sand beaches, as well as the Inland Sea and, before March of last year, the famous Azure Window. RIP! These are just a few of the natural spots in Malta that contribute to the beauty of the island as a whole. Growing up here, kids get to spend the weekend at the beach. They can enjoy themselves building sandcastles and swimming with their friends, whilst Mum catches up on her tan and Dad drinks a beer (likely simultaneously moaning about how hot it is). As the sun sets into the sea, groups of friends replace the daytime beachgoers and sunbathers to get together and have an evening barbecue on the sand. If families and friends aren’t getting together at the beach, most likely they’re hanging out at home, on their balconies, or roofs, or in their yards. But what isn’t common in Malta is a garden. Being only 122 square miles, Malta is a very small island. As Malta’s population rises, so do its buildings. The lack of space in Malta is something that many people mention on a daily basis. Land is scarce and so, for a long while now, developers have begun to build upwards. Just look at the newest project in St. Julian’s, Pendergardens, which is going to be 17 storeys high! More people are buying and renting apartments and fewer people are living in (or are able to afford to buy) a detached house. In Malta, the balcony is the norm and the garden is the exception. Whilst it is amazing to be able to live somewhere where you can chill at the beach or on a sunlit balcony, it’s also a shame that so many people live without the pleasure of a garden. For those of us who grew up elsewhere, the absence of greenery in Malta is sad, and sometimes stifling. In many other countries, including in rural England where I grew up, green fields stretch as far as the eye can see and almost every house, no matter how small, has a garden of its own. The garden is where I spent most of my free-time time as a kid. When my friends and I weren’t playing in the garden, we were having picnics in the park or going on adventures in the countryside. My mom was forever swearing at my brother and me for getting grass stains all over our clothes – because they were a pain to get out – but it was always, always worth the telling-off. Although the lifestyle in Malta is wonderful on so many levels, gardens and greenery is always something that will be missing. That is, unless a priority is put on conserving some of the land that there is left. Plots of land could be saved from a future where they’ll be holding up a high-rise building and be made into a lovely, green park instead. QuickLets and Zanzi Homes are doing more than their share for this cause. The QLZH foundation has vowed to plant 1,000,000 trees over the course of the next ten years. You can read more about this project and all the other great things they’re achieving on the QuickLets Blog. A few little green havens wouldn’t go amiss here in Malta. Especially if they are kept open for the public to enjoy. San Anton Gardens are incredibly popular amongst visitors and locals alike, as are the Upper Barrakka Gardens in Valletta. Imagine, for those of us who rent or own a property without a garden, there were more places like these where we could go and relax or have a picnic. However, for the time being, if you’re living in an apartment in Malta that doesn’t have a garden, then why not make your own? As you drive around the island, you’ll see plenty of homeowners and tenants who have adorned their balconies with plants and flowers. Certainly, these lush balconies catch your eye more than the bare ones! However, unless you have a balcony big enough to hang out on, you won’t be able to spend much time enjoying everything your green fingers have helped to grow. Why not, then, build yourself an indoor garden which you can enjoy all the time! There’s something terrifically fulfilling about cultivating and keeping your own plants alive. Aside from being aesthetically pleasing, an indoor garden can have many benefits. For one, some indoor plants can help to purify the air. Certain types of palm (such as the Lady Palm and the Areca Palm) are efficient at removing toxins from the air, as is the Boston Fern and also the Peace Lily. Having indoor plants is also said to reduce stress; increase your sense of well-being; boost your mood and boost your productivity. If this isn’t enough for you, why not have some indoor plants that can do all of this and more! Keeping herbs inside, for example, would be a great idea for all you foodies out there who love to enjoy cooking with fresh ingredients. In Malta, an Aloe Vera plant for your apartment is a perfect choice! It’ll be especially useful after a day at the beach, when you can just snap off a leaf and use the fresh gel to soothe your sore skin! Light sleepers could also benefit from keeping a plant, such as Lavender or Jasmine, in their bedroom to aid them in getting a decent night’s rest. 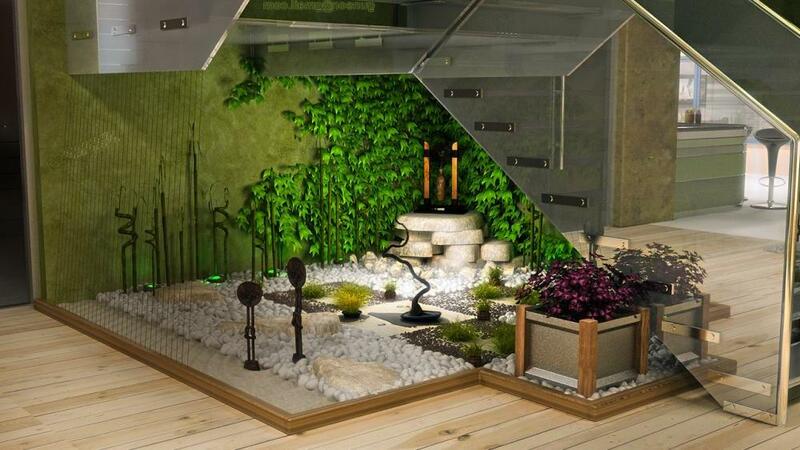 Designing your indoor garden can also be great fun! Make a day (or more) of going shopping for plants and pots that will fit in nicely with the décor of your flat. There are loads of great garden centres over Malta, including in Burmarrad and Attard for example. They all have a wide selection of indoor plants that will thrive in your Malta apartment. In addition to some potted plants, you could fill a bookcase with succulents of incorporate a wall feature into your indoor garden! You can buy some fantastic planters and frames that you can fill with plants and put up on your wall. Even Ikea have a range of accessories you can buy to help build your indoor garden. If you’ve got a bit or creativity (or a Pinterest account), the possibilities really are endless! If you live in an apartment or a flat in Malta, with only balconies and no garden, then give an indoor garden a go. You’ll be breathing better and feeling better in no time! Or, perhaps you’re looking for the real thing! Our friendly and qualified teams at QuickLets and Zanzi Homes can help you in your search for a house with a garden, either to buy or to rent. Contact one of our agents today, over the phone or via e-mail, or even pop into your local branch. We’re specialists in Maltese property and we have the largest database on the island!